Created by Bill Sharpe (Three Horizons: The Patterning of Hope (Triarchy Press Ltd 2013), the Three Horizons Framework is a simple and intuitive tool for thinking about and visualising the process of transformative change. 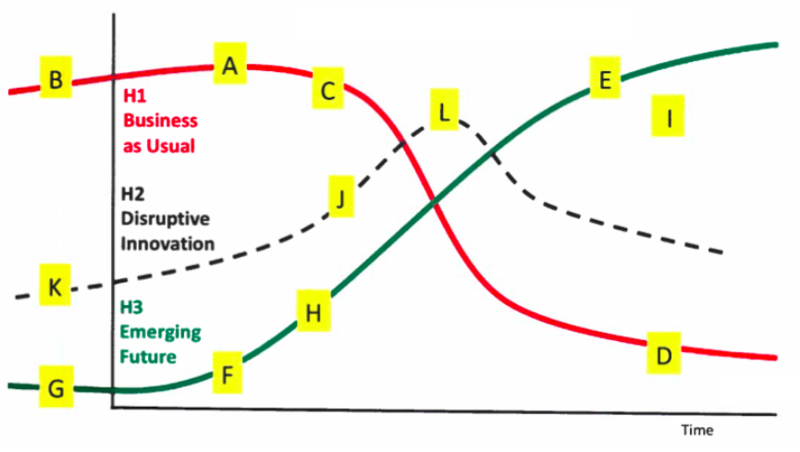 The framework describes three patterns of activity and how their interactions play out over time. It maps a shift from the established patterns of the first horizon to the emergence of new patterns in the third horizon, via the transformative activity of the second. The central idea of Three Horizons and what makes it so useful, is that it draws attention to the three horizons as always existing in the present moment, and that we have pointers to the future in how people (including ourselves) are behaving now. The outcome is a map of transformational potential which enables us to plan and act with more skill, freedom and creativity in the present, both individually and together, to drive towards a desired future outcome. Horizon 1 (‘H1’) is Business as Usual, the dominant way of doing things today. We rely on these systems being stable and reliable. But as the world changes, so aspects of 'business as usual' begin to feel out of date or no longer fit for purpose. H1 contains the seeds of its own demise. Hence over time it will tend to decline. Horizon 3 (‘H3’) is the Emerging Future, the seeds of which are present and visible today. This will grow until it becomes the predominant way of doing things, essentially replacing and improving upon the old H1. 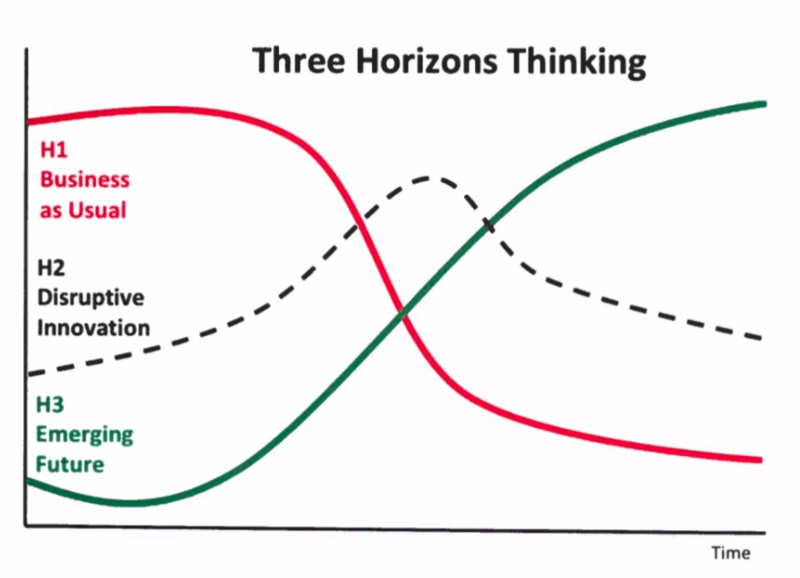 The last, and most interesting horizon, is Horizon 2 (‘H2’) the arena of Disruptive Innovation. This disruption can take many forms: technological, political, ecological or social and will throw up many new ways of doing things, as different players step in and innovate in the dynamic space of change between H1 and H3. Crucially, many of these innovations will be ‘captured’ by the H1 systems and absorbed into them, essentially prolonging the status quo and stifling the emergence and development of H3 (this is known as ‘H2 minus’ (H2-) or ‘sustaining innovation’). Only a few will be ‘harnessed’, paving the way for a radically different future (known as ‘H2 plus’ (H2+) or ‘transformative innovation’). All three horizons are ever present. Aspects of the old H1 will persist in any new ‘business as usual’. Similarly, aspects of H3 are evident, if not obvious, in all kinds of activity on the fringes of the (currently) dominant system. Likewise H2, the developmental link between the past and our vision of the future, is all around us in examples of innovative alternative practice. E) What is the future we want to bring about under H3? What are its key characteristics? What would it look like and feel like to be there? G) Look back - whose work are these present possibilities built upon? What history, values and culture are embedded within them? I) What are the competing visions of the future that are being pursued by others? Could we collaborate with them because we share enough core elements or are they inherently competing visions? If so how do we prevent their vision from derailing ours? L) As a Disruptive Innovator, what kind of guidance can you set for yourself to help influence whether your disruption is captured (extending the life of H1) or harnessed (bringing about H3). What allies will you seek? What action will you take? How will you assess potential offers of collaboration or finance? And how will you work with others to ensure that the H2+ disruption scales and spreads? Whether you are considering the next steps involved in achieving your Vision or the key problems with existing legacy systems, how to enable and drive collaboration with your customers or any potential bumps in the road(map), the Three Horizons Framework adds a valuable resource to your toolkit.